Wow, that's a great find! It's amazing the world of difference one altered page can make to a story. Now that panel with Lando crying makes sense! And it only took THIRTY YEARS to figure it all out, Dru! Yeah, that page pretty much rocks. Very poetic. I particuarly love "how much real glory she has been party to this day." Funny, David: all I see are the awkward words of a young writer who hasn't found his voice yet. (And wouldn't for a few more years.) Glad you found some poetry in there. Me? No objectivity! Wow, what a difference? I like the ending in your version so much more. The last words are much better in your version. I'm glad someone spotted these pages. I am too, Quique. I've waited a long time to see it! I wouldn't compare it with your later work, by any means, but there's definitely poetry there. I'd bet it's a bit harder to find your voice plotting "Marvel style." That's actually not true, David. Just about everything I wrote at Marvel in the 80's and 90's was done that way. I haven't done a story "Marvel style" for a while but, because of time factors, ended up writing CHAOS WAR: THOR that way -- and it reminded me of how much fun it is to work that way. I think I feel another blog post coming on, delineating the advantages -- and drawbacks -- of both "Marvel Style" and full script. Live and learn! I'll read that blog. When does CHAOS WAR: THOR come out? I think CHAOS WAR #1 hits stands today. I'll think I'll check it out. From what I've seen, David, CHAOS WAR is going to be a terrific -- and terrific LOOKING -- book. The first issue of my THOR spin-off comes out in November. Speaking of Thor: I just finished up the 38 page Thor one shot, THOR: SCRIER'S GAME, and had a great time, both writing the script and working (for the first time in something like a decade) with editor Ralph Macchio. I'm kinda pumped about ALL this. Hope to have CHAOS WAR in my hands today, and CW: THOR is something to be thankful for in November. So does Ralph still get Karate Kid jokes like in the old Bullpen Bulletin, or did that ever wear thin?? Seriously, though, one of the best editors in the business. Daniel Laruso's got nothin' on 'im! Ralph is absolutely one of the best editors in the business, David, and it's been a delight working with him again after all these years. Must be nice to have someone still at Marvel who was there when you started. Ralf is gonna be their "Julius Schwartz" (minus the scandal, I hope) in a few more years! Julie Schwartz had a scandal, Jeff? I never heard anything about that. My interactions with Julie were minimal, but I always found him to be a charming, gentle man. And I don't believe I've ever heard anyone say a negative word about him. Didn't you hear? The characters he "introduced" in the 50s and 60s had the same names and powers as ones from the 30s and 40s! There actually was another Flash, Green Lantern and Hawkman before the Schwartz versions! I extensively researched this and was completely flabbergasted! Of course, Ralf did the same thing with the "Ultimate" versions, so maybe he's scandal-bound as well! Not so feeble, Jeff. It was actually pretty funny. Wow, what a find. Interesting, the idea that English children were felt to be able to handle such a radical, pro-peace message. None of that hippie crap in Ronald Reagan's America, no sir! You're a movie buff, JMD, so what do you think about Snyder directing the new Superman film? It's less about Snyder, and more about what vibe I think they need to tap into to make it work. That is pretty funny, Jeff, because until I read Mark Waid's Flash I had no idea there were previous versions of the 50s DC heroes! When I posted the comment on the original CBL story I had no idea that you were unaware that the story had actually been published in it's original form. I must have been 8 when I read the story but it made a strong enough of an impression that when I read the CBL article on the changes nearly 30 years later something about it didn't ring true. Anyway I'm glad that the afternoon spend digging through boxes trying to find why the story sounded wrong was time well spent (though now I just need to convince my wife of that ;) ). Pretty weird, isn't it, Rob? I suspect the Lucas people didn't realize that the "real" version went out in the U.K. I thought Syder did an excellent job with WATCHMEN, David; but, as you point out in your post, Superman is a very different thing. If they go dark and cynical, they've lost me...and the character. To me, Superman's greatest power is his charm. That's what made both George Reeves' and Christopher Reeve's portrayals really work. They both imbued the character with decency and an old-fashioned Hollywood charm. The way they played it, you HAD to like Superman. If Snyder and his writers keep that combo of charm and decency -- and give us a good villain (and no Lex Luthor, we've had enough for a while), this could be great. Word is that Zod will be Superman's first villain in the franchise reboot. Sounds good to me, David! I have printed up that last page and plan to dig out my copy of Star Wars 46 and slip it in at the end of the issue. Cool. Never thought I'd ever get to see the original, un-Fingerothed ending. Pretty amazing that it actually saw print after all, albeit overseas. This is pretty momentous! But I have to say, LONG LIVE LOMBEGO!!!!!! Great idea, Turtletrekker. I should probably do the same! I'll put that LOMBEGO LIVES T-shirt in the mail ASAP, Glenn! I hear Lombego makes a cameo in Casey Affleck's I'M STILL HERE, hiding behind Joaquin Phoenix's beard. He actually IS Joaquin Phoenix's beard. The dislogue on that scene should be messed with one last time to have Lando crying over the plight of Lombego, forced to write something he didn't believe. 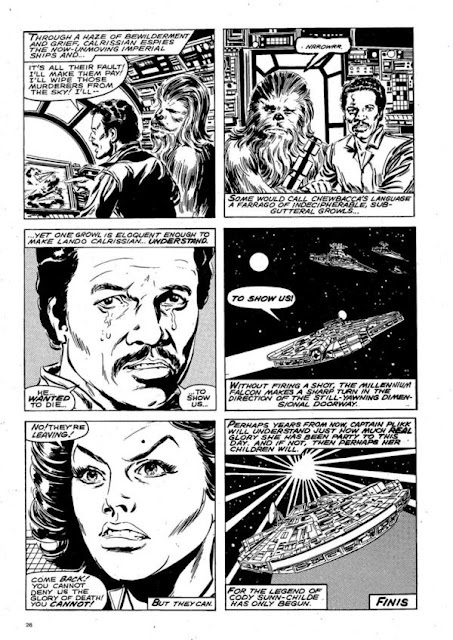 (panel 1)Lando: He was like you, Chewie-- his words could be lost if you didn't listen. (panel 3): TO TELL US!!! If they can continue in that vein, all goes well. We're in near-total agreement, David. (Funny how often that happens.) Last night's episode had me laughing out loud on several occasions -- and the heart was certainly there to balance the comedy. The subplot with the older son and daughter-in-law was still too generic and sitcom-y for me, but compared to the first two episodes, this was a MAJOR leap forward and gives me hope that this show will become something more than an overlong Twitter feed. Here's hoping the audience sticks around to see the positive change, because I need my weekly dose of Shatner. I actually think they should bring the ex-wife into it and cast someone like Candice Bergen -- an actress with chops who could really hold her own against Mr. S.
That would be cool, though I suspect I'd rather her be a recurring character than a permanent addition to the cast. There's something about her absence that lends itself to Ed and Henry's sense of loss. And yeah, the subplot was pretty generic. But it's certainly an improvement over the tone of last week, when uneven writing let the subplot run away with the show. Thanks for reading, JMD, and I hope you have a fantastic weekend. Good morning Mr. DeMatteis. My name is Giuliano and I'm a fan of his from Italy. Excuse me for contact in this way, incorrectly, but I have found other ways. I work in a comic book store and am trying to put all the details of each book and I would do it properly. I found major problems in relation to its name. The humbly ask myself a question: does the J of J.M. corresponds to John or Jean? No one has clear ideas on this matter, as they often appear just as frequently, and Jean Marc or John Marc is indicated. Believe me. I just want to write the correct data. Especially compared to her and other authors. I beg your pardon for having disturbed again. In case you do not consider me a fool I can respond to this mail: giuliano.novi@gmail.com. Real nice to see the original ending for your Star Wars story, JM. My humble opinion about Snyder on the new Superman movie: I, like you, thought he did a very good job with Watchmen, and 300 as well. Glad Lex is not listed as the villain but Zod, for me, is almost just as bad. Don't get me wrong. Lex and Zod are great counter-parts and villains for Superman. But they've both been done to death in live-action--from TV's Smallville to the movies. I would prefer to see Brainiac or Metallo or Darkseid or Mongul even. Something we haven't seen before. Something fresh. Not a retread of Superman II--just as Superman Returns was a retread of Superman:The Movie. Now, who would you like to see portray the Man of Steel, JM? As for who should play Superman...well, William Shatner, of course...with Betty White as Lois Lane. Okay, okay -- I'm kidding. I really have no clue who to cast...although I don't think they should go for Teen Hearthrob Superman. Let's have a mature actor, someone in his late twenties, early thirties, bringing some gravitas to the Man of Steel. Thanks for your reply Mr John Marc DeMatteis. was very kind. I regret that too often in comic book written by you and even in the biographical notes about you, Jean-Marc appear. At least here in Italy. No one has thought to make sure of the meaning of J M.
I must say I quite excited about having talked to an author I've followed for 25 years and let me conclude by thanking you again for your attention to me and then .. thanks for Brooklyn Dreams, thanks for the Justice League and thanks for all the stories of Spider-Man. I loved the Superman/Darkseid epic that ran through S:TAS, JL, and right down to the finale of JLU. Wouldn't mind seeing that adapted for film, nor would I object to "For The Man Who Has Everything" making it to the big screen. It's a classic comic, worked really well on the small screen, and it's such a solid and yet fantastical concept. Love to see a filmmaker embrace those kind of fantastical elements, but Nolan's involvement makes that less likely. Picked up BOOSTER GOLD 35 & 36 today, JMD, and that's the most fun I've had reading comics in a while. I do have one question, because I couldn't find any issues going further back: Why is Booster trying to prove Max's existence? The Maxwell Lord thread comes from the currently-running GENERATION LOST mini: Max has somehow wiped all memory of his existence from all minds...except for Booster and some of the old members of the JLI. A movie version of "For The Man Who Has Everything"? As the guy who wrote the animated version, I'd love that. Alan Moore, on the other hand, would probably be less-than thrilled. Suspect you're right about Moore, which is a shame. Thanks, Eddie. This is the gift that keeps on giving! You're welcome. is it okay if I publish part of your story on my website's comic-release-list? I have been including parts of intervieuws and articles to give a more complete overview of all Star wars comics published. Absolutely, Eddie: go right ahead. I also scanned both the US and UK pages (page 1, 11, 12, 13 & 22): they are linked at the end of the "article" at the bottom of Year 1980, so you can see the differences for yourself. Thanks again, Eddie: much appreciated!